Cannibalism remains taboo throughout most of the world, making it the perfect deviant act to feature in movies intended to shock the audience. Cannibalism in film is hardly a new concept. Across the horror genre, there are many frightening cannibalism scenes, including in some of the scariest horror movies. This list omits zombies and other monsters that tear human flesh, and showcases disturbing scenes from indie and mainstream films that feature regular people feasting on "long pig." As much as humans want to believe monsters are only mythical, these horrifying cannibal scenes reveal that not all monsters hide beneath the bed - some are under the skin. In Raw, Justine (Garance Marillier) transforms from a quiet, bookish vegetarian to a party animal obsessed with her roommate, Adrien (Rabah Naït Oufella), and consuming raw flesh. Plenty of scenes in this movie can turn a moviegoer's stomach, making it difficult to pinpoint the vilest of the bunch. In one notable scene, Justine gets a bikini wax from her sister, Alexia (Ella Rumpf). When Alexia has trouble pulling off the wax, she grabs scissors to remove it. Justine becomes agitated and kicks her sister, causing Alexia to lose her middle finger to the scissors. While most siblings would call 911 and put the finger on ice, Justine instead seizing the opportunity for a snack. Based on the true story of an airplane crash that left a Uruguayan rugby team stranded in the Andes for 72 days, Alive follows the survivors as they decide to eat the dead to sustain themselves. It may be more difficult to watch while knowing it actually happened, but the survivors likely had to resort to cannibalism to endure their 12-day journey out of the mountains. There is a nauseating scene in which the sports team reluctantly eats their deceased fellow passengers, but another arguably more unsettling scene involves a glass shard they use to carve up the corpses - all in the name of survival. Clarice Starling (Julianne Moore) suffers a gunshot wound while attempting to save Dr. Hannibal Lecter (Anthony Hopkins) from a painful death by wild boars. Lecter takes her unconscious body to the home of crooked agent Paul Krendler (Ray Liotta). Starling wakes up handcuffed to a chair while Lecter punishes Krendler by first removing the top of his head. He then delicately cuts out a portion of Krendler's brain and cooks it. 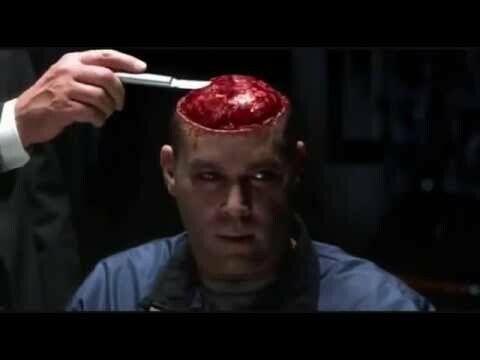 In a final act of vengeance, Lecter makes Krendler eat his own sautéed prefrontal cortex. Rose (Julia Garner), Iris (Ambyr Childers), and Rory (Jack Gore) live with their father, Frank Parker (Bill Sage), after their mother passes away. The family begins partaking in cannibalism as directed by their father, who kidnaps and murders people. Frank forces the girls to kill hostages and then turn them into dinner for the family; this causes a rift in the girls' relationship with their dad. Filled with brutality, violence, and commentary on the morality of family traditions, the film boasts a heinous cannibalism scene where the girls finally snap because of their father's controlling ways. Iris first bites her dad's neck, and Rose joins in on the attack to consume their father. After finishing him, the girls skip town to start a new life - and perhaps carry on their ancestors' unconventional lifestyle.